We can sometimes find roof terrace gardens in the penthouse units of some condominiums. 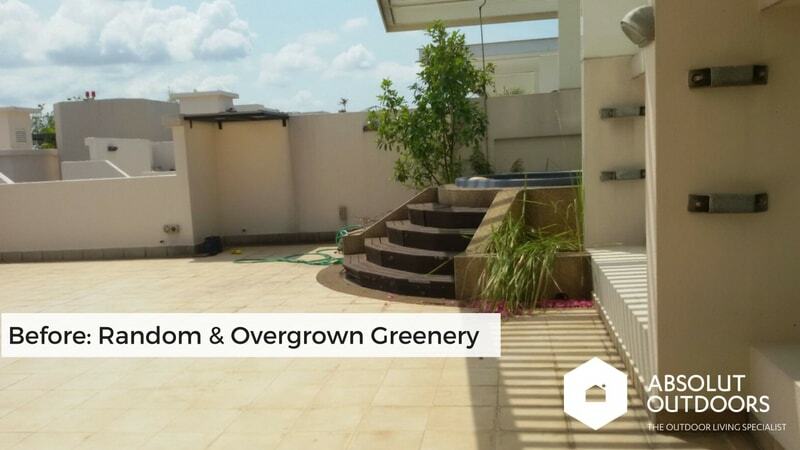 Landed homeowners may also build a roof terrace garden into their terrace, semi-detached house or bungalow. The roof terrace becomes the go-to place for morning coffee with a view and is often the place that homeowners retreat to after a long day at work. Roof terrace gardens are also great for entertaining. 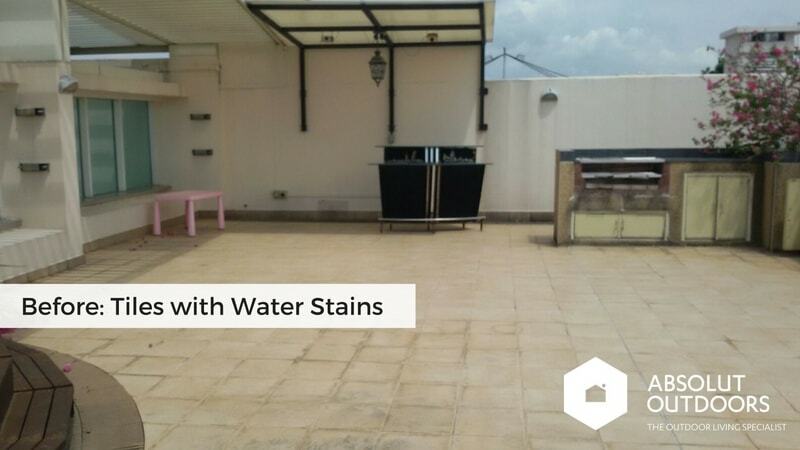 We had the opportunity to help a homeowner transform his roof terrace recently. This is how the roof terrace looked before. The tiles had lots of water stains, and the plants were overgrown. 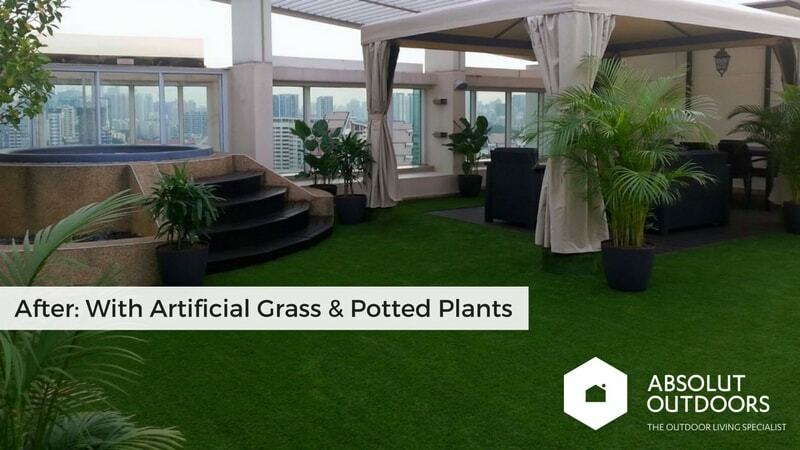 The roof terrace got an instant makeover with artificial grass. We applied our installation experience and techniques from working on large scale gardens to this roof terrace to ensure that rainwater continues to drain away smoothly, and no rubbish or dirt chokes up the drainage holes on the roof terrace. This artificial grass is made of sports-grade material and can last more than ten years. We have many designs of artificial grass for customers to choose from based on the colour, pile height and design. You can view them here. 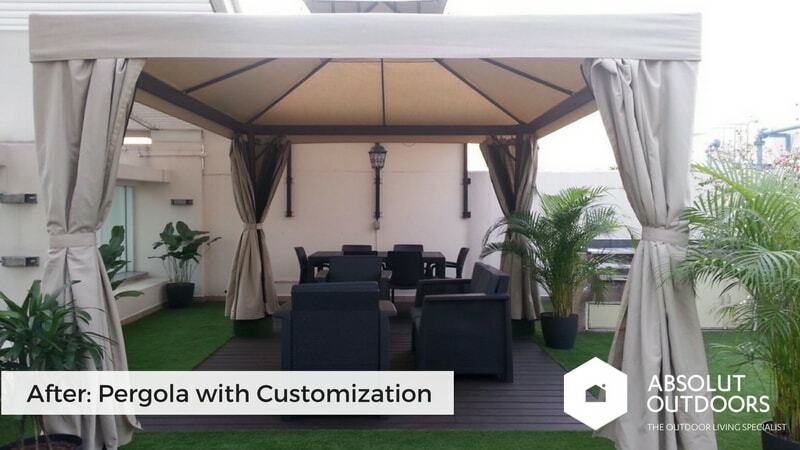 The owner purchased a pergola and we customized it with Absolut Wood Composite Decking on the floor. This gives the roof terrace flooring more visual interest and demarcates the area for the outdoor furniture to be placed on. The Absolut Composite Wood is strong, durable and beautiful. We installed them using composite wood batons (the supporting structure) and not the usual natural wood batons. Why? 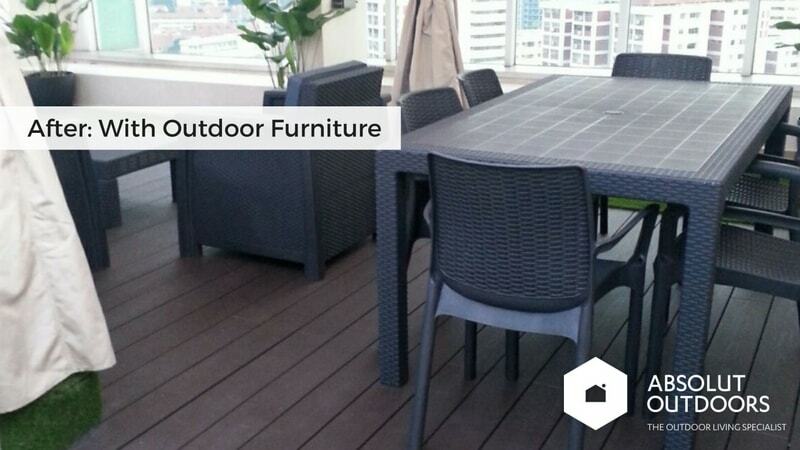 Because natural wood rots over time, especially in Singapore’s hot and humid weather. 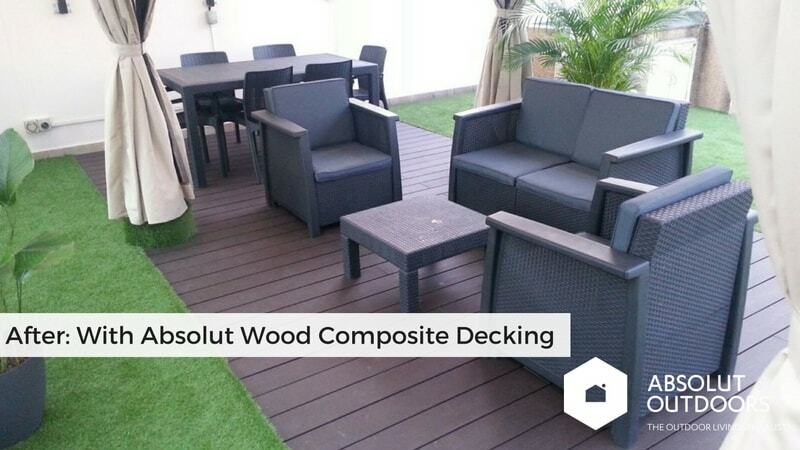 This ensures that the Absolut Wood decking system is built to last. 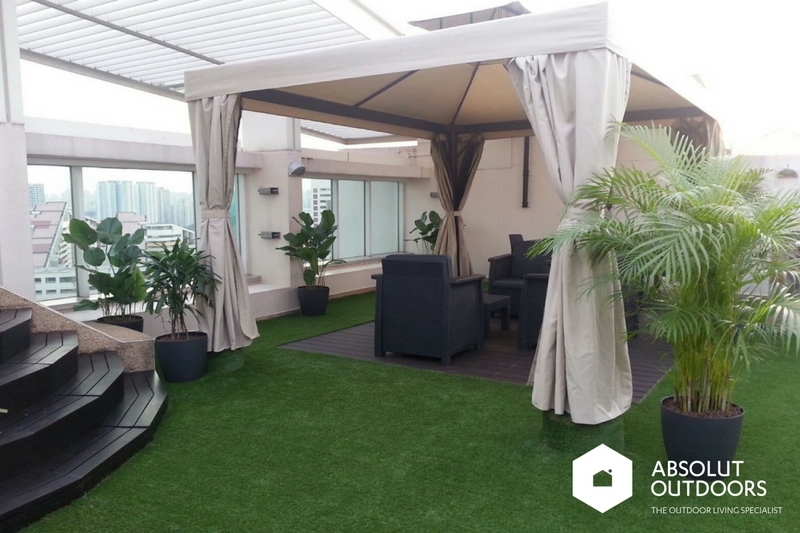 Some sturdy outdoor furniture provided much need seating and potted plants completed the manicured look of this roof terrace. The potted plants are easy to care for and easy to replace if necessary. I hope you like this roof top terrace renovation transformation we did here. 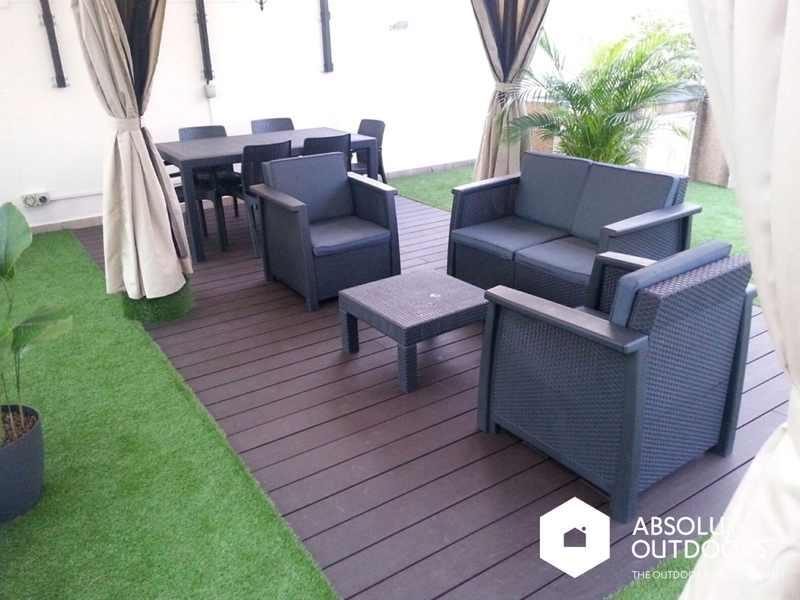 Please contact us at enquiry@absolutoutdoors.com if you’d like us to provide any outdoor renovation ideas for your roof terrace, garden, private enclosed space or balcony.